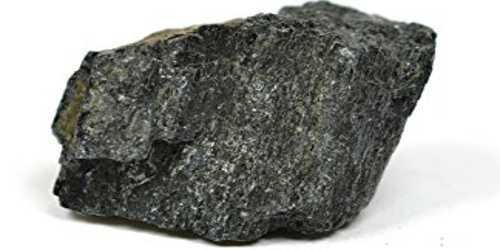 Hornblende is a complex inosilicate series of minerals (ferrohornblende – magnesiohornblende). The general formula can be given as (Ca, Na)2-3(Mg, Fe, Al)5(Al, Si)8O22(OH, F)2. It is a dark brown, black, or green mineral consisting of a silicate of calcium, magnesium, and iron, occurring in many igneous and metamorphic rocks. It is an important constituent in acidic and intermediate igneous rocks such as granite, diorite, syenite, andesite, and rhyolite. It is not radioactive. Hornblende has a hardness of 5–6, a specific gravity of 2.9–3.4 and is typically an opaque green, greenish-brown, brown or black color. Its cleavage angles are at 56 and 124 degrees. It is most often confused with various pyroxene minerals and biotite mica, which are black and can be found in granite and in charnockite. Hornblende is a common constituent of many igneous and metamorphic rocks such as granite, syenite, diorite, gabbro, basalt, andesite, gneiss, and schist. It is the principal mineral of amphibolites. 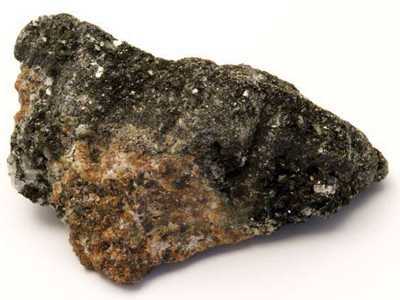 A rare variety of hornblende contains less than 5% of iron oxide, is gray to white in color, and named edenite, from its locality in Edenville, Orange County, New York.